The Kenshokai Iaido Dojo's mission is to preserve and teach traditional Japanese swordsmanship through the art & discipline of Iaido. 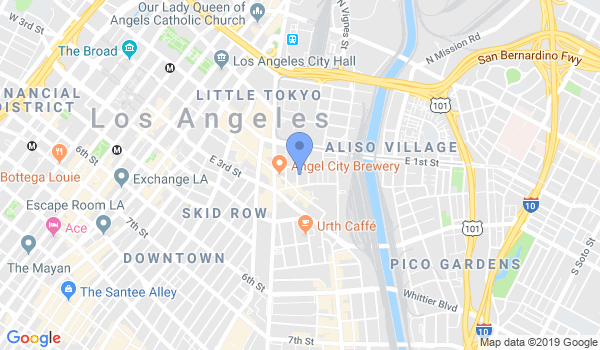 Our dojo is located in the Little Tokyo area of Los Angeles. We welcome all earnest individuals who are serious about studying the art to apply for membership and train with us. At Kenshokai Dojo, we teach traditional forms of Iaido, as we were taught by our teachers. We trace our lineage directly back to sword master Nakayama Hakudo, famed martial artist of the early 20th century. Kenshokai's Chief Instructor Jeff Wheeler began his training in 1988 under the direct tutelage & guidance of master swordsman, Aikidoist and Zen Priest Kensho Furuya. Following Sensei Furuya's passing in 2007 Wheeler Sensei continued as the student of Sensei Gary Myers - Furuya Sensei's senior instructor. In 2013 Myers Sensei, Mr. Wheeler and Furuya Sensei's senior students formed Kenshokai to continue the sword traditions we were taught. Our classes are adult only and are held on Wednesday evenings and Saturday mornings. Interested prospective students are encouraged to contact us and observe a class. To observe a Wednesday evening class, simply arrive 5 to 10 minutes prior to 6:00 pm. To observe a Saturday morning class, please contact us directly for access to the training hall at that early hour. Would you like more information on hours, classes and programs available at Kenshokai Iaido Dojo? Please contact the school with your questions. Update the details, Write a Review or Report Error of Kenshokai Iaido Dojo. View all Dojo in Los Angeles or in Zip code 90012.